Bicycles account for 64 percent of Nijmegen’s commuter traffic. Nijmegen, 2018 European Green Capital, fights climate change with renewable energy, compact development and a transportation system that puts bicycles in the driver’s seat. However, this city of 171,000 people, 40 miles southeast of Amsterdam, recognizes that climate change adaptation is also needed. To prepare for increasingly severe storms, Nijmegen is converting its downtown to permeable green infrastructure as well as enlarging the Waal River floodplain and creating new civic places, recreational spaces and wildlife habitat in the process. Over half of all homes in The Netherlands are vulnerable to flooding. A worst-case flood could inundate half the country, affecting 10 million people. The Waal River, which makes a sharp right turn at Nijmegen, jumped its banks in 1993 and 1995, forcing the evacuation of 250,000 people. For centuries, the Dutch responded to flooding by building higher dikes. But the increasingly extreme storms resulting from climate change have prompted a new approach: moving the dikes back to make room for ever-expanding rivers. In the 1990s, The Netherlands studied 100 bottlenecks and picked 39 projects based on many criteria including the enthusiasm of the local citizenry (ClimateWire, 2012; HUD User, 2015). With a price tag of $460 million, Nijmegen’s “Room for the River” is the most expensive of these 39 projects. Aimed at defending against a 1,250-year flood, Nijmegen and its partners have relocated the old dikes, dug a secondary, three-kilometer-long channel and formed a new island which will feature parkland, performance space, bike paths and pedestrian promenades. 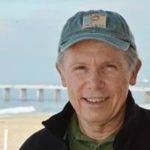 The design also creates room for nature, improving stream ecology and adding 30 different types of habitat including mudflats, meadows and forests. In conjunction with other projects upstream and downstream, Nijmegen is helping to repopulate the Waal River and its re-contoured floodplain with sturgeon, beaver, sea eagles and otter. Scheduled for completion in 2016, this project has already won international awards for innovatively combining water management with urban redevelopment and environmental restoration (ClimateWire, 2012; HUD User, 2015; Nijmegen, 2015). 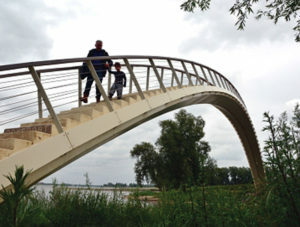 The footbridge links downtown Nijmegen with the farms, woods, trails and cycle paths of Ooijpolder. 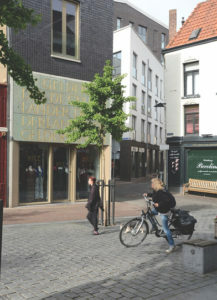 Projections of future flash flooding have motivated Nijmegen to replace concrete and other impervious surfaces using landscaping elements that disconnect pavement from water systems and reuse storm water while creating more attractive urban environments. Together with eight partners in five countries, Nijmegen formed a group called Future Cities aimed at adapting to climate change as well as mitigating it. Future Cities urges communities to “enjoy adaptation.” In response, Nijmegen prepared a plan called Green Allure Inner City that shows how the city center can be beautified as well as fortified by building pocket parks, gardens and topiary while making streets, roofs and even walls literally green. To put this plan in action, Nijmegen replaced parking lots and vacant parcels with parks, re-landscaped streets and subsidized the installation of 40 green roofs (Frehmann and Althoff, 2010; Future Cities, 2013; Nijmegen, 2007; Nijmegen, 2015). 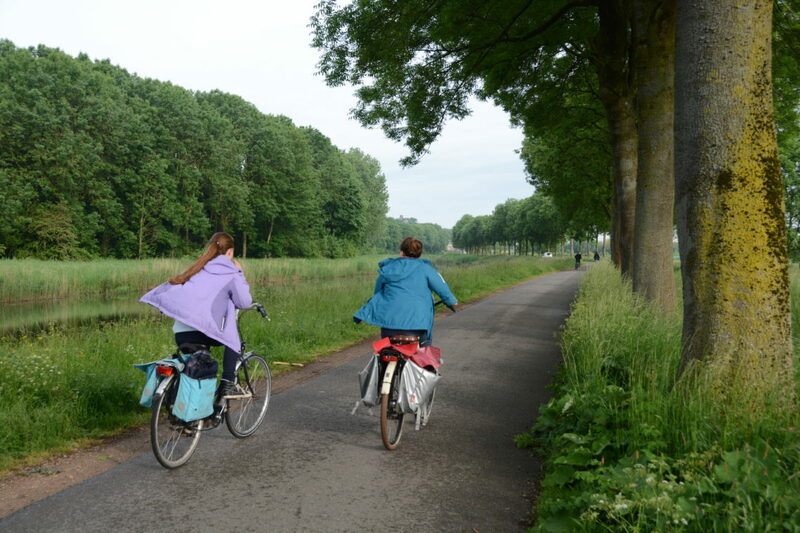 The Nijmegen plan envisions a compact city surrounded by a green belt that is easily accessible on foot or by bicycle. The Ooijpolder forms the eastern segment of this greenbelt, offering miles of walking and bicycling opportunities only a footbridge away from downtown. In addition to agricultural land and historic sites, natural areas make Ooijpolder one of ten ecological hotspots in Nijmegen’s greenbelt. Over 600 hectares of the southeastern portion of the greenbelt were formerly used as a military training area but are now protected as natural forests and heathlands. Until recently, the Waal River formed Nijmegen’s northern border and the river’s floodplain served as the northern segment of the greenbelt. However, Nijmegen and its partners are now building an eco-friendly community north of the Waal River as well as Park Lingezegen, a 1,700-hectare greenspace with distinct subareas for recreation, agriculture, nature and conservation of water resources. Lengezegen Park also creates a buffer with the City of Arnhem and effectively serves as the new northern segment of the greenbelt (Nijmegen, 2015; Park Lingezegen, 2016). retail space within an intricate network of gardens, courtyards and pedestrian alleyways reflecting this district’s pre-automobile history. In contrast with the current demand for “starchitecture”, Hessenberg emphasizes quality public space over flamboyant building design (Europaconcorsi. 2015; Nijmegen, 2015). Nijmegen aims to be energy neutral by 2045 with the help of 16 wind turbines, a million solar panels, 40,000 solar boilers, 11,000 households on district heating systems plus increased reliance on biomass and geothermal. Nijmegen is already off to a good start, reducing per capita CO2 emissions by over 16 percent between 2008 and 2014. Much of this success resulted from commitments to reduce fossil fuel dependency in Nijmegen’s largest companies and institutions including the city and public utilities. After two rounds of energy covenants, these organizations had saved almost 300,000 tons of CO2, a 36 percent reduction. In 2016, Nijmegen will begin converting GDF Suez, a huge coal fired power plant, to an assortment of renewable sources including solar, biomass and wind (European Commission, 2016; Nijmegen, 2015). Nijmegen’s transportation system also deserves credit for mitigating climate change. Streets are clearly categorized as “access” (with adjacent bike lanes physically separated from motor traffic) or “traffic limited” (where speeds are limited to 30 kilometers per hour). Nijmegen built three bike bridges over the Waal River plus parking spaces for 5,200 bikes in downtown and 8,700 bikes in at the railway station. Nijmegen also offers 43 kilometers of bicycle superhighways and plans to expand its network to 80 kilometers. These bicycle superhighways extend to nearby cities as well as major destinations within Nijmegen including a university with 19,000 students. On the 16-kilometer bike superhighway called the RijnWaalpad, bicyclists have priority at most intersections, allowing a 45-minute spin between the City of Arnhem and Nijmegen, within a corridor that is home to 12,000 work sites (Bicycle Dutch, 2015; Bicycle Dutch 2016a; European Commission, 2016; Nijmegen, 2015). Nijmegen has made the city easy to navigate by bicycle and the people have responded by bicycling. This city of 171,000 residents is home to 250,000 bicycles. Bicycles account for 64 percent of all commuter traffic here and represent 37 percent of all trips of 7.5 kilometers or less, a larger percent than cars. In 2016, the Netherlands Cycling Union picked Nijmegen as The Cycling City of The Netherlands (Bicycle Dutch, 2016b; European Commission, 2016; Nijmegen, 2015). This recognition, plus its accomplishments in green structure, infill development and climate change mitigation/adaptation, explain why the European Commission selected Nijmegen as the 2018 European Green Capital. Bicycle Dutch. 2015. The F325 Fast Cycle Route Arnhem – Nijmegen. Accessed 7/5/16 from http://bicycledutch.wordpress.com/2015/09/29/the-f325-fast-cycle-route-qrnhem-nijemegen. Bicycle Dutch. 2016a. Nijmegen, Cycling City of the Netherlands? Accessed on 7/5/16 from http://bicycledutch.wordpress.com/2016/04/05/nijmegen-cycling-city-of-the-Netherlands/. Bicycle Dutch. 2016b. And the winner is… Accessed on July 6, 2016 from https://bicycledutch.wordpress.com/2016/05/19/and-the-winner-is/. ClimateWire. 2012. How the Dutch Make “Room for the River” by Redesigning Cities. Scientific American. January 20, 2012. Europaconcorsi. 2015. Hessenberg Urban Renewal. Retrieved on July 2, 2016 from https://divisare.com/projects/243485-awg-architecten-Hessenberg-Urban-Renewal. European Commission. 2016. European Green Capital Award 2018 – Technical Assessment Synopsis Report. Brussels: European Commission. Frehmann, T. and Althoff, A. 2010. Adapting urban water infrastructures to face the effects of climate change – from strategy to technical implementation. Accessed on July 6, 2016 from http://documents.irevues.inist.fr/bitstream/handle/2042/35653/11204-197FRE.pdf?s. Future Cities. 2013. The Future Cities Guide: Creating Livable and Climate-Proof Cities. Essen: Lippeverband. HUD User. 2015. A Dutch Approach to Flood Resilience. Accessed on July 2, 2016 from https://www.huduser.gov/portal/periodicals/em/winter15/highlight3_sidebar.html. Nijmegen. 2007. Groene Allure binnenstad Nijmegen. Nijmegen: City of Nijmegen. Nijmegen. 2015. Application – European Green Capital 2018. Nijmegen: City of Nijmegen. Park Lingezegen. 2016. Park Lingezegen. Website at http://parklingezegen.nl/introductie-park-lingezegen/.